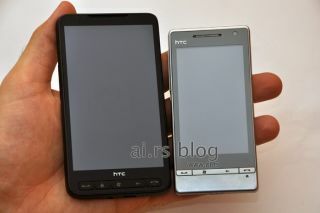 New pictures of HTC's Leo have emerged, showing off the gargantuan 4.3-inch screen Windows Mobile phone. Packing a 1GHz Qualcomm processor, this is one mobile that's going to pack a real punch, especially if Windows Mobile 6.5 is as big a success as Microsoft hopes it will be (read our early Windows Mobile 6.5 review). What's more impressive is that it pretty much matches the specs thrown down by forum member 'forum' on HTCpedia. A new video, discovered by WMPoweruser, shows the new phone running through a few functions, and the multi-touch on board pretty much confirms it's going to be a capacitive screen. It also brings a 5MP camera with dual LED flash, making it one of the first phones from HTC to bring a flash despite the company promising more of a focus on this feature earlier in the year. We've no idea when the UK release date is for this massive device, but it's bigger than any other phone out there (and hopefully a lot better than the TG01) but only time will tell whether that's a good thing or not.